The Greater Phoenix Chamber of Commerce’s Public Affairs team advocates for your business at every level of government. 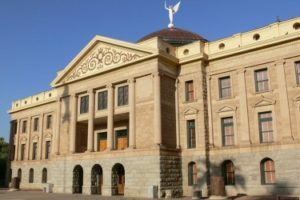 Each year, during the second week of January, the Arizona Legislature opens for session and begins the hard task of drafting, reviewing and passing legislation. As a membership benefit, the GPCC team is hard work during legislative session ensuring the lawmakers understand the business community’s perspective on relevant issues. Our team is the voice of business at the state capitol. Each year, GPCC establishes a policy guide that establishes guidelines for GPCC’s position on legislative bills. The policy guide is created through the GPCC’s committee process. Leading up to legislative session, the six issue committees meet and determine which issues GPCC will support or oppose. The guiding principles drafted by each committee are then approved by the overarching Public Affairs Committee, and ultimately the GPCC Board of Directors. Once legislative session starts, the GPCC team maintains regimented tracking lists with all the bills that apply to the business world in terms of the committees’ specialty issue. These bills are then reviewed monthly by the specific issue committee, and then supported or opposed by the overarching Public Affairs Committee. As a GPCC member, we welcome you to get involved and advocate for your business with us! To stay informed, visit the Policy and Advocacy section of the Chamber’s website to review policy committees and bill tracking. To best represent your business and the politics that affect it, get to know your legislators and reach out to them for assistance with any tricky issues your business may be enduring. You can also register in the Request to Speak system at the Legislature so you can provide testimony in committee to your elected officials. They represent you, so make sure your voice is being heard!